If you have been wondering how to become an electrician, the short answer is: Become an apprentice. In the past, before colleges became popular, all trades were learned through apprenticeships. You would find a Master of the trade you were interested in and learn from him through practical experience. This is still the case with most trades, except now you also need technical training in a classroom. The classroom portion provides in-depth knowledge of how electricity works, how to read and follow blueprints, electrical code and the duties expected of an electrician. Most electrician apprenticeship programs are sponsored by joint training committees comprised of local unions, such as the International Brotherhood of Electrical Workers and the National Electrical Contractors Association. Other sponsors may be management committees from individual contracting companies or local chapters of various contractor unions. Due to the thorough training an apprentice receives during his apprenticeship program, all who complete the program are qualified for electrical maintenance work and construction electrical work. To apply as an electrician’s apprentice, you must be at least eighteen years of age and hold a valid high school diploma or GED. You must have advanced mathematical skills, as well as be fluent in English, since most of the electrician instructional manuals are written in English. You must also pass a skills test, and meet several other requirements. The electrician apprenticeship program generally lasts three to five years. Each year, the apprentice is required to attend at least 144 hours of classroom training, and 1,000 to 1,500 hours of on the job training, under the supervision of a Master electrician. This combination of classroom learning and practical experience is how to become an electrician. In the classroom, the apprentice learns electrical theory, and how to install and maintain electrical systems. Apprentices are also required to take mathematical classes, learn to read blueprints, electrical code rules and safe electrical practices. An apprentice may also be trained in specialized soldering, alarm systems, communication systems and industrial equipment. Electrician apprentices usually start their training by drilling holes, setting anchors and attaching conduit, along with various other low-level duties. Gradually they will be given more important duties, such as: measuring, preparing, designing and installing conduit. Then: installing, connecting and testing electrical wiring, power outlets and switches. The apprentice learns how to become an electrician through a combination of observation and practice. 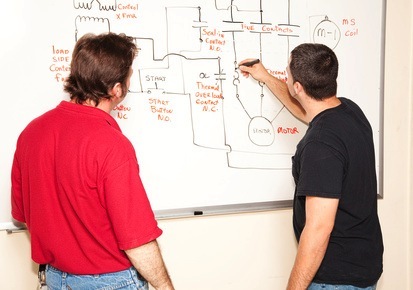 He or she must learn to lay out and draw the circuitry for a complete electrical system. An apprentice must prove he has mastered the use of electrical tools and proper work practices, in order to successfully complete his apprenticeship program. When learning how to become an electrician, many applicants choose to get all of their classroom training prior to seeking a position as an apprentice. Electrician apprentice training is offered by several technical schools and trade schools associated with local contractors and electricians unions. Companies employing electricians will often hire graduating students who have completed all of the required electrician training and passed the aptitude test. These students are started in a more advanced level of apprenticeship program than those without the classroom training. In rare cases, an aspiring electrician may have the opportunity to work as an electrician’s helper. By assisting the experienced electrician, organizing job sites, collecting materials and performing various non-electrical work, you can gain advanced knowledge of the electrician trade. This will put you ahead of other applicants and improve your chances of securing an apprenticeship position. Some skills necessary to becoming an electrician cannot be taught. You need to have about average manual dexterity, be physically fit, posses good hand-eye coordination and have an excellent sense of balance. You must also be able to quickly and accurately solve mathematical problems. An electrician apprentice must have color vision. Most wires are specifically colored to let electricians know their purpose. An electrician frequently has to identify wires just by their color. Having a solid work history or a military background will increase your chances of being accepted into an apprenticeship program. Union committees and potential electrician apprenticeship employers consider these valuable traits. In most jurisdictions an electrician is required to be licensed. Licensing requirements for an electrician can vary from one jurisdiction to another. 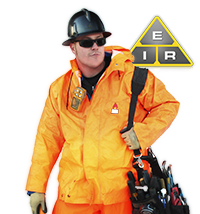 An electrician must normally pass an examination specific to the location in which he plans to practice to prove he has learned electrical theory, and has knowledge of the National Electrical Code and local building and electrical codes. It is highly recommended that experienced electricians continue their education to keep on top of any changes in electrical codes and new methods or materials available for use in the installation of electrical systems. Installing and maintaining video systems is a good example. Recently, these systems have become more common and their use more prevalent. Knowing how to maintain these systems could prove quite useful. 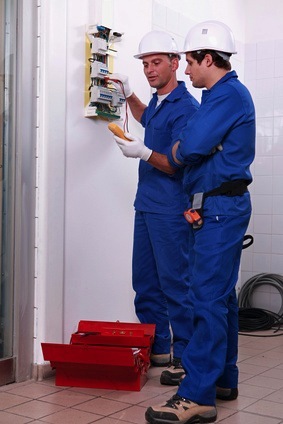 Once you know how to become an electrician, you may want to advance in your career. Some electricians start their own businesses. But since electrician training does not include business management, not everyone can become self employed. In many jurisdictions, this may also require an electrician contractor license. Most experienced electricians become supervisors of new apprentices, construction superintendents or project managers. You can work with the company that gave you your apprenticeship training, or secure a job with the city or county. These are all very fulfilling and satisfying careers. Once you have completed all your apprenticeship training and become a full-fledged professional electrician, you may even decide to become a teacher and train new apprentices how to become electricians.